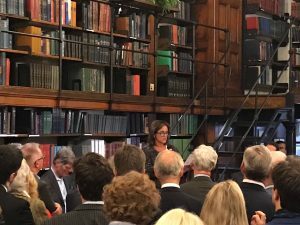 Darling Winston, the book of letters between Winston Churchill and his mother Jennie awarded a 5* review by The Daily Telegraph, was launched in front of a large crowd at the London Library on 20 September. Among those attending were Randolph and Jennie Churchill, great-great-grandson and great-great-grandaughter of Britain’s wartime leader. Darling Winston is published by Head of Zeus in the UK and (as My Darling Winston) by Pegasus Books in the USA. Signed copies of the UK edition can be purchased at https://www.davidlough.uk.